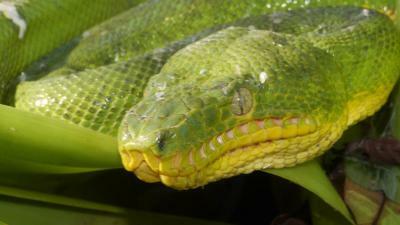 A member of the boa family, South America’s green anaconda is pound for pound, the largest snake in the world. Its cousin, the reticulated python, can reach slightly greater lengths, but the enormous girth of the anaconda makes it almost twice as heavy. Green anacondas can grow to more than 29 feet (8.8 meters), weigh more than 550 pounds (227 kilograms), and measure more than 12 inches (30 centimeters) in diameter. Females are significantly larger than males. 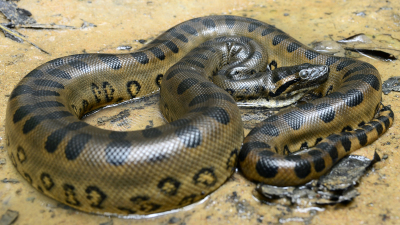 Other anaconda species, all from South America and all smaller than the green anaconda, are the yellow, dark-spotted, and Bolivian varieties. Anacondas live in swamps, marshes, and slow-moving streams, mainly in the tropical rain forests of the Amazon and Orinoco basins. They are cumbersome on land but stealthy and sleek in the water. Their eyes and nasal openings are on top of their heads, allowing them to lay in wait for prey while remaining nearly completely submerged. They reach their monumental size on a diet of wild pigs, deer, birds, turtles, capybara, caimans, and even jaguars. 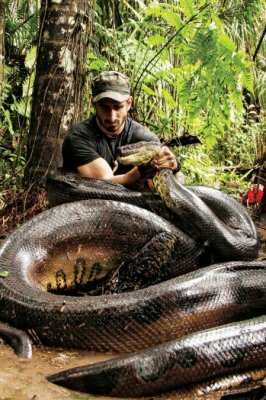 Anacondas are non-venomous constrictors, coiling their muscular bodies around captured prey and squeezing until the animal asphyxiates. Jaws attached by stretchy ligaments allow them to swallow their prey whole, no matter the size, and they can go weeks or months without food after a big meal. Female anacondas retain their eggs and give birth to two to three dozen live young. Baby snakes are about 2 feet (0.6 meters) long when they are born and are almost immediately able to swim and hunt. Their lifespan in the wild is about ten years. The South American names Ana Auch Oa and anaconda were suggested in an account by Peter Martyr d'Anghiera, but the idea of a South American origin was questioned by Henry Walter Bates, who, in his travels in South America, failed to find any similar name in use. 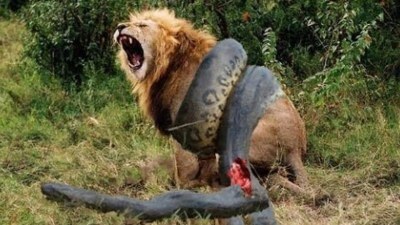 The word anaconda is derived from the name of a snake from Ceylon (Sri Lanka) that John Ray described in Latin in his Synopsis Methodica Animalium (1693) as serpents indices bubbliness anacondas felonious, ides bubblegum Ali Oru Que jumentous member conference. Ray used a catalog of snakes from the Leyden Museum supplied by Dr. Tancred Robinson, but the description of its habit was based on Andreas Cleyer, who in 1684 described a gigantic snake that crushed large animals by cooling and crushing their bones. Henry Yule in his Hobson-Jobson notes that the word became more popular due to a piece of fiction published in 1768 in the Scots Magazine by a certain R. Edwin. Edwin described a tiger being crushed and killed by an anaconda when in fact tigers never occurred in Sri Lanka. 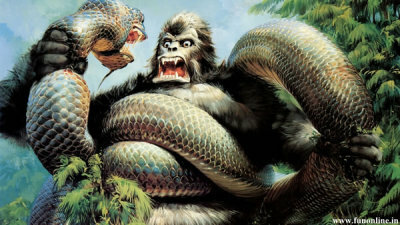 Yule and Frank Wall noted that the snake was, in fact, a python and suggested a Tamil origin an-Condra meaning elephant killer.